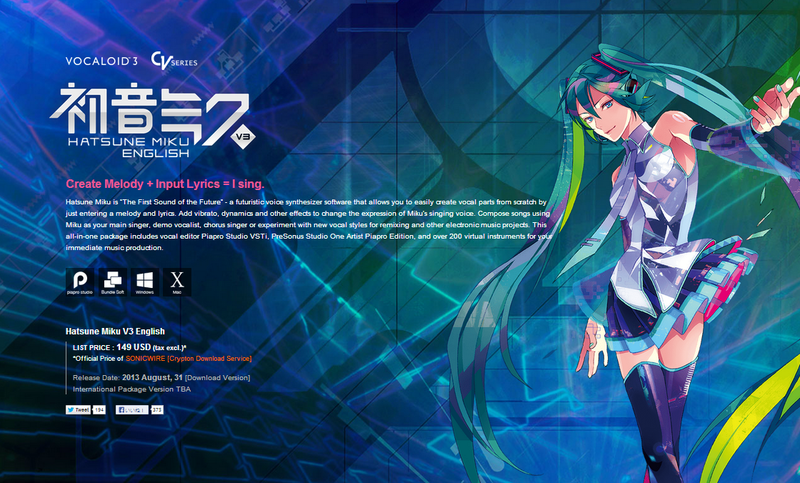 Crypton Future Media has finally announced an official release date for the Hatsune Miku V3 English Vocaloid software: August 31, 2013. August 31 was the exact same date six years ago (2007) when the Japanese version of the Hatsune Miku Vocaloid software was released. The date is widely acknowledged by fans to be the birthdate of Hatsune Miku. The entire software package, which supports both Windows and Mac operating systems, will be sold for US$149 (excluding tax), and available digitally online through the Crypton online store service, Sonicwire.